Target % of Yield ? * USE THIS THE DATA FROM THIS PROGRAM AT YOUR OWN RISK AND RESPONSIBILITY. The user must have all suggested values checked by a qualified engineer for accuracy and applicability prior to implementation. Hytorc Division Unex Corporation, its subsidiaries, employees, contractors and assigns shall not be responsible for the use or mis-use of any data or advice provided or for any injuries or damages resulting from anyone's reliance upon such data or advice. Welcome to this interactive flange bolting calculator from HYTORC.The program computes recommended torque values , bolting patterns, tool selection and pump pressure settings for standard ASME B16.5 and API 6A flanges under normal assembly conditions. Torque calculations are based on the simplified formula explained in the current version of ASME PCC-1, Appendix K. As gasket load requirements for standard flanges generally fall within the mid-range of the bolt loads, gasket stress has not been used to calculate torque values. 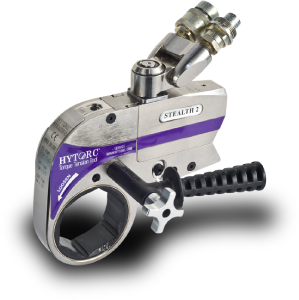 The hydraulic wrench options are the premier Avanti® square-drive or Stealth® low-profile tools. Please use the data from the program as a guideline only* This program will not produce appropriate results if you are dealing with non-standard flanges, or metal-to-metal machine or structural joints or where extreme temperatures or other unusual operating conditions or materials are being used. For assistance with special joints, data when using other Hytorc tool models, or for advice on other advanced bolting topics please submit the bolting survey form or call HYTORC at 1800-FOR-HYTORC (367-4986) for immediate attention without cost or obligation. The program will work in standard U.S. customary units (inch) or SI (metric) units.